We can print just the sling for your deckchair. If you have a tired old plain deckchair why not liven it up and improve your garden look with a fancy new deckchair sling? We can custom print and make a sling that will refurbish your deckchair so get creative and design your sling right here. Here at Bags of Love we are always printing and making bright exciting new things. Since we already make custom deck chairs we decided to offer just the slings to people who have already got deck chairs but are bored with the same look or want to replace the tired colour scheme with something more exciting. We can print stripes photos, logos or combinations to make any graphics that you want to print. Try it out - but be warned we only make for one size of deckchair, and that is 42 cm wide in the internal space where the sling goes. Our sling, therefore, is 41cm wide when finished. We cannot make custom sizes, so if your deck chair is a different size it will not be a perfect fit. Delighted with our photo deck chair sling, the quality of the photos is excellent and the canvas a reasonable quality too. Website was easy to use and the service very prompt. Excellent communication and service delivery as described. The product itself was brilliant and very similar to what I expected to be. Only comment, it took me a while to figure out how to edit the text on the design tool, had to edit each word separately and it would have saved sometime if there was some help. the product is very good quality and the design i put on there is really good. it also came before its estimated delivery time aswell. Great service, fast. Great end product. Thanks. If you already have a deckchair but you are thinking of livening it up a little bit, the printed deckchair sling could be the perfect opportunity to revitalise a dull and dreary design! It is so easy to attach onto your existing chair and provides a beautiful addition to the garden during those fabulous summer months. If you like nothing more than to relax in the garden with a cold drink or a cup of tea as you read your favourite novel or chat with friends, the printed deckchair sling would be a lovely way to treat yourself. Choose your most precious photo and have it printed onto the high-quality material. Custom deckchair sling made in London, UK, and delivered to you in a matter of days. Once you have designed and ordered your sling you should receive it in a few days. Once it arrives, you have a small task - and that is to attach the sling. If you bought our tacks just take another look at our web page for the diagram or the pack for the fitting instructions to see where the tacks go. Measure out the spacing and with a regular household hammer, bang the tacks in to secure the sling. Make sure you test your deckchair carefully before sitting in it fully to avoid an accident. Always check the locking stand is firmly in position at the back and then push down firmly with both hands on the sling to check it is secure. Your deck chair sling is made in the same way as the majority of our fabric products. Our print technicians, using a deep penetration printing method digitally print your sling. Eco-friendly inks are infused into the fibres of the canvas material which has been chosen due to its natural strength and durability. Once printed the fabric is cut to size by our talented craftsmen, and then hemmed by our expert seamstresses. This is all done in a matter of days, not weeks, by hand to order. Our QC department will check your personalised deckchair sling before shipping it to you. When you are preparing the artwork for your sling there are a few things to bear in mind. If preparing one single image, the finished visible area is 41cm x 114cm. We add the bleed/hem by mirroring your graphic so artwork should be sized to 41 cm x 114 cm. Deckchair slings are great for those artistic portrait photos that you have. Another great design idea is to create a collage. With such a big canvas, you are able to print a number of photos to get a truly unique look for your garden furniture. Personalised picnic chair perfect for al fresco dining. Three customisable areas, maximum load 140kg. Deck Chair with your design, photo or montage printed on the seat sling. Design yours online. It's a deck chair only wider. 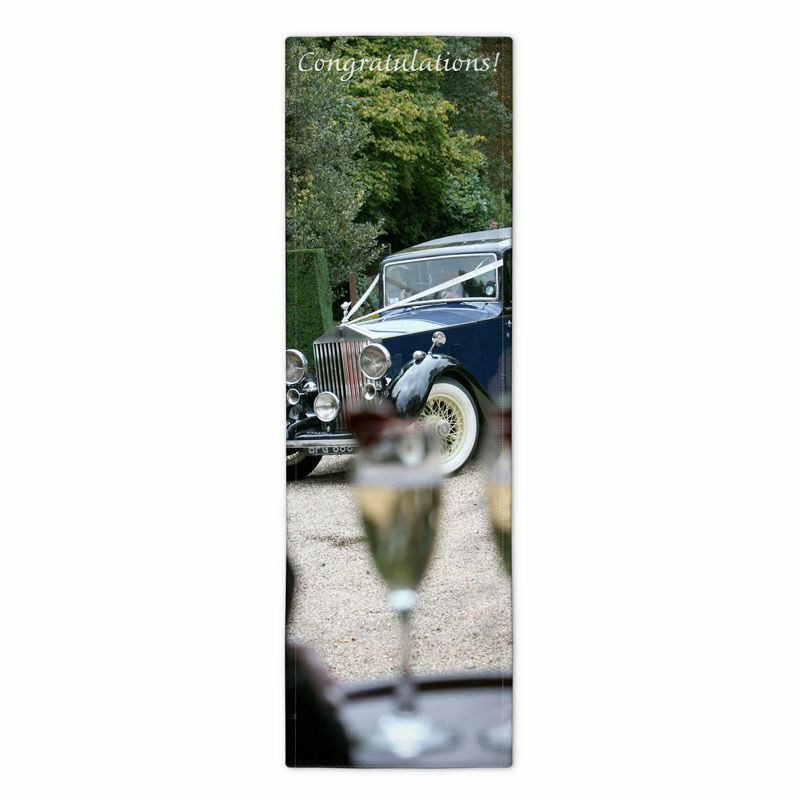 Wideboy hold two people so great for Mr and Mrs anniversary idea, or a good fun gift.